With Nature's Way OmegaSea Omega-3 + Vitamin D all you need is one super-tasty teaspoon a day! 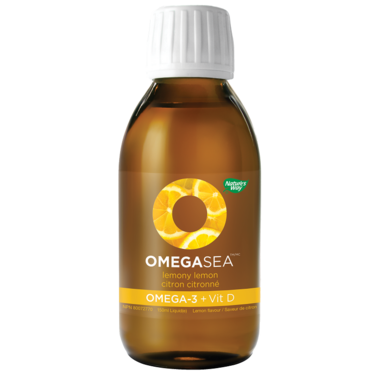 OmegaSea is a great-tasting and made with ultra-pure Omega-3. Directions: Adults and adolescents 14 years and older take 1 tsp. daily. Children 1–13 years take 1/2 tsp. daily. Shake well before each use. After opening, refrigerate and consume within 100 days. Do not use if safety seal is broken or missing. Ingredients: Fish oil (anchovies, sardines, mackerel, herring) vitamin D3, high oleic sunflower oil, natural flavours, tocopherols (derived from non-GMO soy), green tea extract, medium chain triglycerides, monk fruit extract. This omega 3 oil taste great. Pleasent lemon flavour. Leaves a bit of an oily lining in your mouth but you can wash it away with water. A great way to get your healthy oils into your diet.